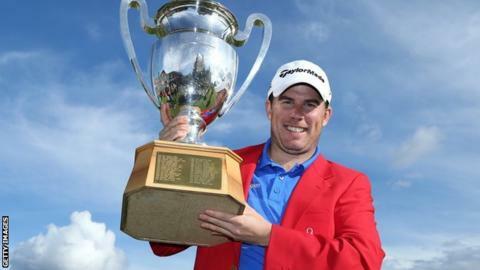 Richie Ramsay says his European Masters win was a timely boost - for Scottish golf and ahead of his own wedding. Ramsay's win came the week after fellow Aberdonian Paul Lawrie won the Johnnie Walker Championship. "It's been an unbelievable last few weeks," Ramsay told BBC Scotland. "As well as myself and Paul winning, a lot of guys have been playing well. "I've only got three weeks to go to my wedding, so it's nice to get that win under my belt." Ramsay does not expect to be buying a bigger wedding ring for his fiancee despite the boost in prize money. "As far as I know, it's still the same one I gave her," said the 29-year-old. "I think she is more than happy with the one she's got, so I don't think there will be an upgrade. "She might get a few other presents if she's lucky." Ramsay finished four ahead of a chasing group of four in Crans-sur-Sierre to secure his second European Tour title and his first in three years. "It is fantastic to have multiple winner on the European Tour beside my name and it's something I'm very proud of," he said. "The strength in depth on the Tour is incredible and it's increasing year upon year. "With the guys chasing me down, I just stuck to my gameplan and the adrenalin rush you get when the last putt sinks is just incredible." Ramsay was delighted that his win would lead to invitations to bigger tournaments, something he hoped would further help improve his world ranking. It was a victory that brought some welcome cheer to a Scottish golf scene that has been looking for new heroes after the ageing Colin Montgomerie's fall down the rankings. "Especially at Gleneagles, there were something like five or six guys in the top 20, so it's not just myself and Paul," added Ramsay. "There's other guys who are chipping away there. "I had a chat with Paul on the way round and you can see from the way he's playing, he's full of confidence for the Ryder Cup. "If we can get another few guys up there winning titles then we can show how strong Scottish golf is."